Campbell: “No question, Chevrolet has got to carry the volume” for GM, now that the automaker is down to four brands. DETROIT -- What do the modern family, young people, truck lovers, performance enthusiasts and the "eco-culture" have in common? They're all part of Chevrolet's target audience, says the brand's new chief, James Campbell. Launching a marketing plan that reaches each tops his to-do list. Campbell, 45, a marketer by trade, takes over as Chevrolet works on a marketing theme to replace the 5-year-old "American Revolution." The new ads will launch in the first half of 2010, Campbell said last week after his appointment. He declined to give more details. Campbell's predecessor, Brent Dewar, left to pursue personal interests and spend more time with his family, General Motors Co. said. Through November, Chevrolet's U.S. sales dropped 27 percent, more than the industry's 24 percent decline but less than GM's 32 percent slide. GM will lean on the brand as the market recovers and as the company makes up for departing brands Saturn, Pontiac, Hummer and Saab. "No question, Chevrolet has got to carry the volume, so I definitely feel the responsibility of that," Campbell said. "So goes Chevrolet, so goes General Motors." Campbell, a GM lifer, worked in field sales and customer relationship management before joining Chevrolet in 1998. There he helped launch products such as the Cobalt, HHR, Colorado and several Corvette models. 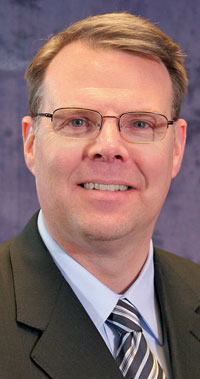 He eventually directed GM's retail planning before becoming head of GM's Fleet and Commercial Operations in February. Campbell said his work on the Corvette in particular taught him to understand customers and meet their needs. In the coming year, Campbell will launch the Cruze small car, the re-engineered Silverado heavy-duty pickups and the Volt plug-in hybrid. The Cruze is a high-volume vehicle, but because it will get up to 40 mpg on the highway, it will join the Volt in appealing to the "eco-enthusiast," he said. Campbell is the first major appointee of GM's U.S. sales and marketing chief, Susan Docherty. She announced his new job a few hours before GM said Campbell's Buick-GMC counterpart, former Ford Motor Co. marketer Michael Richards, had quit after eight days with the company. GM spokesman Chris Preuss said the company probably will seek an outside replacement.